I quickly realized that what they were asking was, “What are the benefits to my business?” Whether you realize it or not people are searching for your brand on social media sites like Facebook, Twitter, LinkedIn, Instagram, and YouTube. What information is awaiting them when they reach these social media platforms? Do you have a polished site that is active and engaging, or do you have a site that was started in 2010, and has 3 updates since? Here are three quick benefits to your business using social media. The younger generation, like GenYs and Millenials, crave information – quick and dirty… and they don’t want to spend time looking for it. Through sources like Twitter, Facebook, and Instagram they can subscribe only to the updates that they need. While the majority of the population walks around with a mobile phone, the preferred mode of communication is texting, tweeting and Facebook posts. Millenials prefer to communicate through short, one-off messages – a format that is found through social media sites. Is your business there to communicate back? Now that you have a social media presence, what are you doing to actively recruit or sell to new clients? While it is important for your social media accounts to have a personal voice, it is important to let your customers know that you’re open for business. Consider adding applications to your Facebook Page that draw customers to your online shop/marketplace, or consider highlighting past clients through photos that they submit and tag. 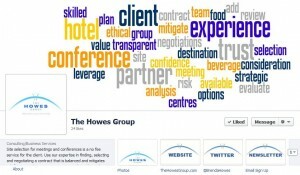 What are people saying about your company? Has your company been tagged on Instagram? What are fellow tweeters tweeting about your company? Whether you like it or not, it’s happening! It’s important to develop a strong social media presence to respond and interact with these mentions. I hope this clears up some misnomers about social media. Take a few minutes this afternoon and search out your company, and let me know what you find! Although Twitter supplies 19 pre-made background option, users have the opportunity to upload a custom branded image. So why not get creative (or get your graphic designer to get creative) to develop a background that represents your brand. A simple background that showcases your logo, or an intricate background that includes all your social media contact information – both are great options. 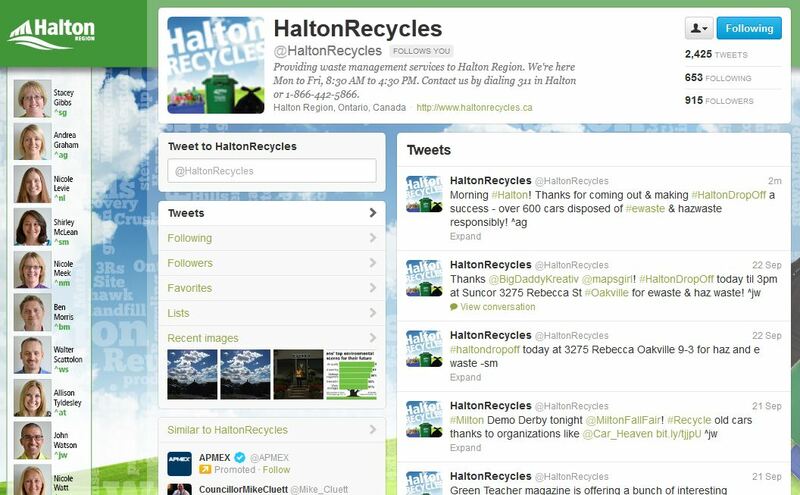 I love what Halton Recycles did for their background. Because they have a number of individuals updating their account, they include their photos, names, and Twitter handles so that residents know who they are communicating with! 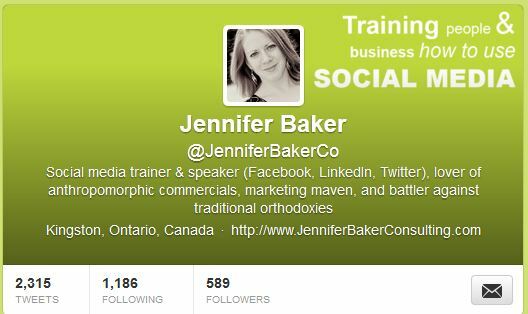 This is a new change to the Twittersphere as of late September 2012. 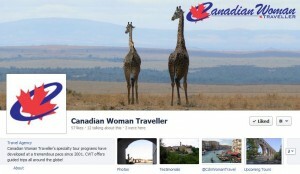 Users now have the ability to even further brand their image via their Twitter profile. The folks at Twitter have realized that we are a visual generation who constantly seek images to which to relate. While users are still waking up to this change, why not be one of the first in your social circle to make this leap. Note: The image dimensions are 1200x600px, and a max size of 5mb. Okay folks. This is not the first time I have told you about Twitter Profile Photos. First, find one that represents your brand. This could be your company logo, a variation of your company logo, or your professional photo. Now take this image and upload it! No one wants to follow a yet-to-be-hatched Twitter egg. Kingston’s KEYS Job Centre developed a custom Twitter profile picture to advertise their job postings! To follow you, to not follow you… that’s the question. By providing a descriptive and relevant Twitter bio, users will be able to determine if you’re an account that is worth following. Include key words about your business, and the product/service that you offer. It is very clear what @MenchiesKTown is providing to Kingston – FroYo! I hope that you take advantage of these great branding opportunities! 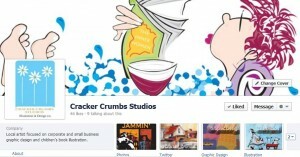 You’ve finally taken the plunge and created a Facebook Fan Page for your business. Your mother, naturally, is your first fan… I mean “like.” Your big brother, media savvy sister, and peculiar second cousin have brought your “likes” up to four. Oh, don’t forget to “like” your own page – that makes five. 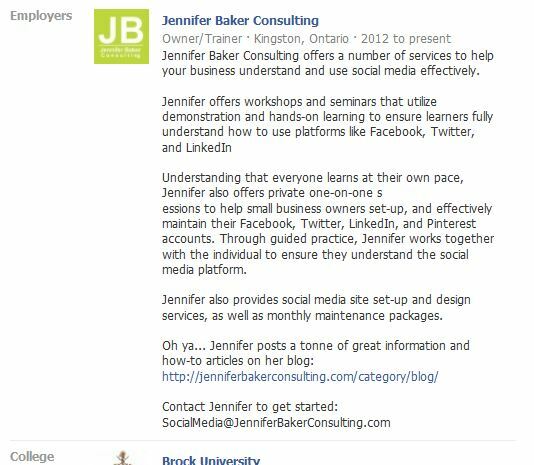 Include your Facebook Fan Page URL in your business email signature. Some people prefer to include the complete web address (i.e. 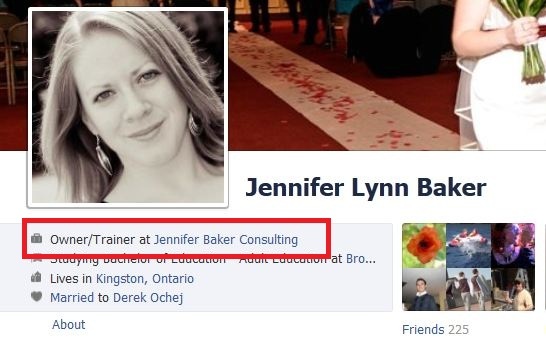 facebook.com/JenniferBakerConsulting), while others prefer to include the Facebook logo that links directly to your Facebook Fan Page. Either way, both are really great ways to encourage people to navigate to Facebook and check out your page. Social plugins are embedded social features that provide individuals on external websites with information and a way to interact with your Facebook Fan Page. These plugins on external websites work by pulling content from your Facebook Page. This underutilized (free) tool is provided by Facebook – all you need to do is add the code to your website. If you’re wondering, my favourite code is the “Like Box” because it streams new content from your Facebook Page. 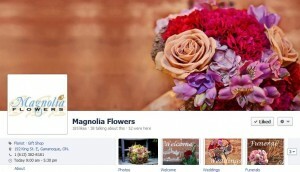 To start using Social Plugins, visit the Resource section of your Facebook Page. These three tips will help you grow your Facebook audience!